The beginning of a long dark period for Lemmings: The Idiot Strike. This running joke proved to be a polarizing moment for the strip’s fan base. “Fan base?” Kenyon has 1900 people, that’s students, faculty & staff. The first comic in the “village idiot” series. It was to be the first longer-running story for Lemmings, which seemed like a way to grow the strip. 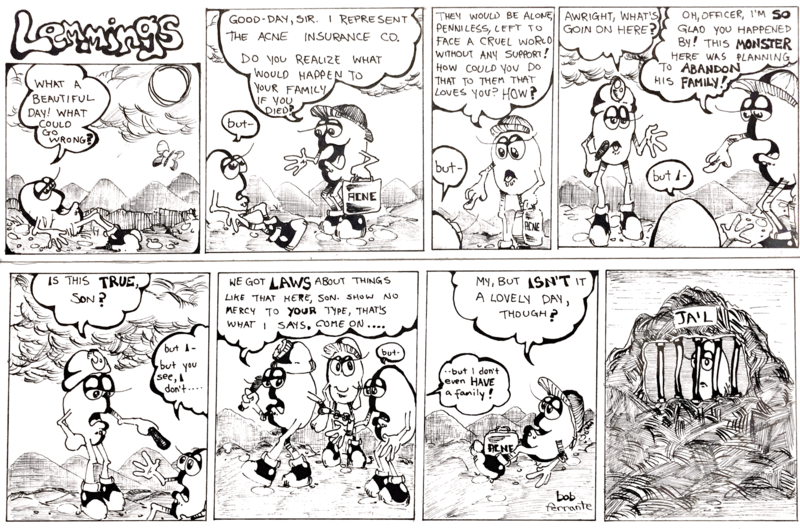 The first “Sunday size” (1/2 page) Lemmings strip, as published in the Kenyon Collegian. I had already pre-cut all the bristol board for 10 strips ahead and didn’t have the money to buy new, so I did it with two strips and they had to cut out the line when they photographed it. I hope you enjoy it more than the printer did. To those on the Sanctuary Playwrights Twitter list, I’m only sharing this one comic with the list, only so you can be aware my comics will in the future only be shared via @bobjudeferrante on Twitter, and of course, on my Patreon page at https://www.patreon.com/bobjudeferrante. This is the last Lemmings comic in the first series. You can see I’m starting to get the hang of the comic’s style. This is a little farther along in terms of style. I don’t know what happened to the butterfly afterward. This is the first Lemmings comic I can find. It’s from around 1976.